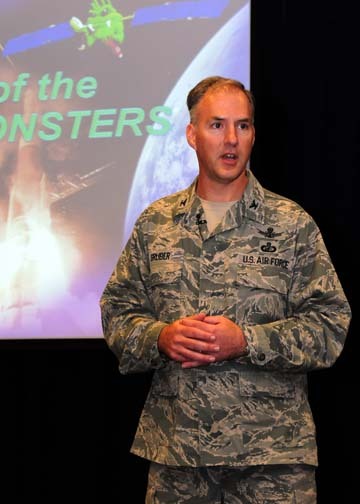 Last month, USAF Col. Bernard Gruber stepped down after three years of running the Global Positioning Systems Directorate at Los Angeles Air Force Base. The GPS Directorate, originally established in 1974 as the NAVSTAR GPS Joint Program Office, is responsible for development, acquisition, fielding and sustainment of all GPS space segments: the modernized operational control segment (OCX), the next-generation GPS III satellites, and modernized GPS user equipment (MGUE). Under Col. Gruber’s watch, the directorate racked up some significant accomplishments in all of these areas: several GPS IIF satellites were launched, the GPS III program received authorization to initiate long lead parts procurement for the first two production vehicles, the OCX continued development, and user equipment moved along its modernization trajectory. In 2011, the GPS Directorate and the Aerospace Corporation received the Air Force Chief of Staff Team Excellence Award. At a June 13 change-of-leadership ceremony, Gruber turned over responsibilities for the directorate to its new chief, Col. William Cooley. Gruber has since retired from the Air Force after 26 years of service. Before he headed off, Gruber spoke with Inside GNSS’s Washington correspondent, Dee Ann Divis, in a wide-ranging conversation about what he had accomplished and what remains to be done in sustaining the nation’s preeminent positioning, navigation, and timing system. Inside GNSS: How has the GPS constellation, ground control system, and user equipment changed since you assumed command of the Directorate? Col. Gruber: Quite a number of things have changed, let me see if I can take one at a time. Since I took over as the System Program Director in July 2010, we have launched three more GPS IIF vehicles and disposed of two GPS IIA vehicles. Additionally, we now have 10 L2C signals and 3 civilian L5 signals being broadcasted; so, dual-frequency navigation for civil users is quickly becoming feasible, and several commercial receivers are tracking the new signals today. Additionally, we completed deployment of all the selective availability, anti-spoofing module (SAASM) functionality to achieve (secure assured GPS), a critical set of capabilities for the warfighter. After receiving Milestone A approval, we awarded three contracts to develop the next generation military receivers, known as military GPS user equipment (MGUE) and performed several Flex Power operational tests, which are an important anti-jam capability. The bottom line, the GPS constellation remains healthy and is getting better all the time. For the ground development program our Next Generation Operational Control System has made significant progress and recently completed a critical Milestone B approval in November 2012. This was a huge vote of confidence to continue development of the system and set the program baseline for Congress. The program is poised to deliver the next generation of GPS space vehicle command and control capability, replace legacy ground systems, and support legacy and future GPS space vehicles and signals. Furthermore, we are implementing unprecedented Information Assurance controls to the architecture. My confidence is high now in that we have completed two exercises to verify telemetry, and planning information is correctly being passed between the ground and satellite. The program schedule remains on track to deliver capabilities according to the Acquisition Program Baseline objectives that was approved at the recent milestone. One of our major hosted payloads, the United States Nuclear Detonation Detection System recently operationally delivered a modernized fixed ground control system. Although we don’t talk about it too much, the new system provides increased information assurance security, increased communications bandwidth, increased redundancy, and doubles the number of antenna channels available to receive and report NUDET information. This delivery culminates seven years of product development, fielding and testing and provides a modernized capability to the warfighter that will meet requirements far into the future. User equipment, like all the segments, has undergone a tremendous modernization effort. When I assumed command we were still going strong on the production legacy user equipment programs: Defense Advanced GPS Receiver (DAGR), Miniaturized Airborne GPS Receiver 2000 (MAGR2K) and the Advanced Digital Antenna Production (ADAP). The next-generation M-Code Military GPS User Equipment (MGUE) program was just starting to gain strength. Now, we are on the verge of transitioning our legacy equipment programs to sustainment and we have made great strides to ultimately develop M-Code receivers. We have gone from a technology maturation effort to testing an operational assessment using full GPS receiver cards and live sky M-Code. We also saw the first munitions test shot acquire M-Code after firing. We have made significant steps forward in the actual acquiring and fielding of M-Code receivers. We are also continuing to explore alternate architectures for GPS receiver cards to continue to push the realm of the possible so military receivers will move closer to same type of devices you see in the commercial sector like smart phones. Inside GNSS: What has most surprised you about your job? While they may not understand GPS contributes some $70 billion to our economy, or that there has been two billion GPS receivers sold, or that the ranging accuracy at 65 centimeters is the best it’s ever been, they understand the value. And I’m very proud of the men and women who support the development and deployment of these systems. Inside GNSS: There have been several years where the civil contribution for the GPS program lagged or fell short. How has that impacted the GPS system and the work of the Directorate? Has it impacted you personally? Col. Gruber: Our cooperative efforts with the DoT and FAA have jointly benefited all agencies and I personally maintain a very good relationship with my colleagues there. However the civil contribution shortfall has been one of my greatest challenges as it has taken away substantial money on the program. We are working with DoT and FAA to implement a recovery plan to the FY11/12/13 funding shortfalls; our goal is still to ensure these shortfalls don’t impact either the DoD or civil GPS requirements, but it will be tough. I am hopeful that we will be able to work an allocated steady state funding profile in the future. Inside GNSS: Gil Klinger, the deputy assistant secretary of defense for space and intelligence told Congress on April 25 that the Defense Department was assessing whether to accelerate the OCX program. What would accelerating OCX entail? Col. Gruber: The Next Generation Operational Control System program is on track to deliver capabilities in accordance with its Acquisition Program Baseline that was approved with the November 2012 Milestone B. This meets the constellation sustainment need date and was approved by the Under Secretary of Defense, Acquisition, Technology, and Logistics. We believe the program is synchronized very well to meet the needs of the first GPS III and full rate production of new GPS military user equipment. Inside GNSS: The controversy over LightSquared got a lot of attention in 2011 – how did that fight impact what you were doing at the Directorate? Col. Gruber: It sure did get a lot of attention. Our work with LightSquared invigorated our need to ensure we maintain spectrum protection for GPS our critical infrastructures depends on it. The work illustrated the importance of efficient use of valuable spectrum, while at the same time, highlighting the differences in protection needs between communication systems and navigation systems. As a result of the LSQ analysis we are taking a more proactive approach in analyzing impacts from other systems using frequencies close to GPS, as well as increasing our understanding of the limitations of GPS receivers. As you know, the GPS signals which are on the order of one femtowatt, and can be overwhelmed by outside interference sources including those in adjacent bands. Inside GNSS: Having now largely weathered the challenge posed by LightSquared, is the Directorate approaching frequency interference issues differently in any way? Col. Gruber: Yes we are. We learned several important lessons from this event. Primarily, we were able to show people that the spectrum protection needs of a satellite navigation and timing system like GPS are quite different from those of communication systems. As that fact is not widely understood, we need to continue to articulate those differences and help the U.S. government evolve the spectrum protection criteria to better protect navigation and timing systems like GPS. Many commercial users, like banks, cell towers, and transportation systems, depend on GPS for accurate time. Other global navigation satellite systems (GNSS) are facing similar challenges, and the US has made commitments to protect other GNSS signals in the US so that they can protect our signals abroad. We have been working with the FCC and the National Telecommunications and Information Administration (NTIA) to that effect, and we will continue to work through the International Telecommunications Union (ITU). Inside GNSS: How have our relationships with other national GNSS programs changed in the time that you have been in command? Col. Gruber: I think that our relationships continue to grow especially from a space perspective and the emergence of global navigation satellite systems like BeiDou and Galileo. Also, we have seen a recommitment by the Russians to sustain the GLONASS system. I’ve watched and supported agreements be put in place now with 55 countries, seen a continued strength in international sales and our initiation of the first two worldwide authorized GPS user conferences were a huge success. Locally, our relationship with the launch program office has become much more interactive as we examine dual launching GPS IIIs but also new launch vehicles. In addition, as the nation’s source of positioning, velocity, and timing information, and through the LightSquared testing, I have become much more aware of the significantly positive impact that GPS has on our nation’s economy, as evidenced in the growing relationship between the GPS Directorate and the Departments of Defense, Transportation, State, Interior, Agriculture, Commerce, and Homeland Security. Inside GNSS: There has been talk of the White House reexamining the overall policy governing the GPS system. What suggestions would you make if you could? Inside GNSS: Sequestration is a huge budgetary challenge. What changes have you had to make to deal with this? What kind of budget-driven changes do you expect to see in five years? A decade from now? Col. Gruber: Although sequestration is a challenge, we continue to focus on reducing our costs and identifying innovative approaches to more efficient acquisitions and systems. As an example, we have conducted a number of architecture studies looking at reducing the size, weight and power associated with our satellites. As our Commander, Gen. Shelton says, this is the time to take advantage of cost-saving opportunities that many of us have tried to pursue in the past. And he’s right. Sequestration is affecting the entire investment budget across the Department of Defense, and is forcing us to balance our current operational activities against increased capability for the future. The rest of the world has watched how GPS has changed modern warfare and is used daily in the commercial sector. It is imperative we continue to provide assured PNT for the US and our allies. Having said that, we must also ensure we are being good stewards of the taxpayers’ dollars. We have really focused on a back-to-basics approach to ensure we get the most buying power for each dollar we spend. The focus on making smart investment decisions will continue over the next five years and beyond. We are going to have to scrub our programs to only move forward with the ones that are meeting cost and schedule goals. The budget environment for the Department of Defense will continue to be level throughout the decade, but I think our three modernization efforts across space, ground, and user equipment will reach a production and stabilization phase over the decade and that in turn, can reduce costs again. By way of example, we saved $50 million over four years by inserting more rigidity and predictability into when we launch GPS IIF satellites and we reduced our ground sustainment contract by almost 50 percent. The strong health of today’s GPS constellation should allow us to launch on a fixed schedule, which also significantly reduces cost. Inside GNSS: There are at least two studies underway looking at the future of the GPS system. What kinds of options are being discussed? Col. Gruber: In response to House Report 112-479 to accompany the National Defense Authorization Act for Fiscal Year 2013, the GPS Directorate developed a report titled “Lower Cost Solutions for Providing Global Positioning System (GPS) Capability.” Two significant studies being examined include a smaller positioning, navigation and timing (PNT)-only GPS Navigation Satellite (NavSat) to augment GPS III, protect the industrial base and dual launch of GPS III to save money. The Secretary of the Air Force recently released the document; so, both of the studies are still being examined. The GPS Directorate, under the leadership of Air Force Space Command HQ, is preparing for a variety of possible scenarios that are driven by budget uncertainty. One example of cost saving for the OCX program is the recent implementation of affordability initiatives that delivered efficiencies and avoidance and will reduce the entire lifecycle costs of the system. Internally, we continue to pursue value added proposals like Li-ion batteries, more efficient solar arrays, and lighter power amplifiers. We need to continue these R&D efforts to reduce total lifecycle costs and to ensure our engineering expertise does not dry up. Inside GNSS: As you get ready to move on to a new opportunity, what are you going to miss the most? Col. Gruber: While I know it sounds like a cliché, I am going to really miss the people I work with and the incredible number of people I have gotten to know over the past three years. To work on this great system, to have a goal of providing our country — and the world, for that matter — with sustained, accurate, and available PNT; to be a part of a fabulous revolution of GPS applications is, well, something special. I’ve been proud to be a part of this program, the free service it provides to the world, and the incredible economic benefit it’s has for our country, courtesy of the U.S. Air Force.